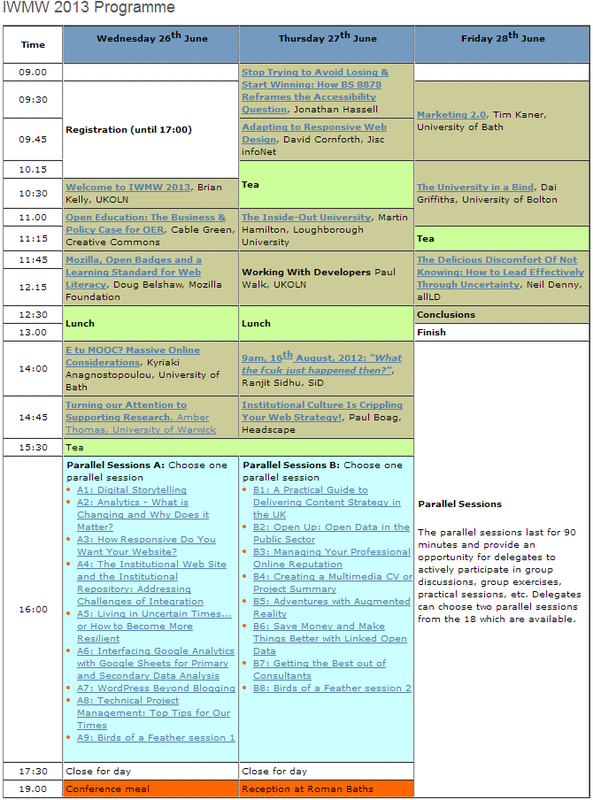 Bookings are now open for this year’s Institutional Web Management Workshop, IWMW 2013. This year’s event takes place at the University of Bath on 26-28 June. Due to the number of submissions we received we decided to extend the programme so that this year will, I think, have the largest number of plenary talks in the 17 years the event has been running. In addition to the 13 plenary talks there are also 17 parallel workshop sessions each of which lasts for 90 minutes and provides an opportunity for delegates to address a particular topic in depth. Since we appreciate the pressures which those who have responsibilities for providing institutional Web services face, this year we are providing opportunities for participants to enhance their skills and knowledge across a range of areas relevant for those who support online services. The theme of the new opportunities which can be provided by embracing open practices is further developed by Doug Belshaw, formerly of JISC infoNet and now working for the non-profit Mozilla Foundation who will talk about Mozilla, Open Badges and a Learning Standard for Web Literacy. The importance of the Web in Supporting Key Institutional Drivers will be addressed in the session on the afternoon of the first day of the event. The need for people with a variety of skills in the provision, support and development of online services will underpin the talks on E tu MOOC? Massive Online Considerations by Kyriaki Anagnostopoulou, head of the e-leaning team at the University of Bath and Amber Thomas manages the academic technologies team at the University of Warwick who will describe how her team is Turning our Attention to Supporting Research. The second day of the event begins by hearing about The User Experience. Jonathan Hassell, lead author of the BS 8878, the British Web Accessibility Standard that help organisations to embed accessibility competence within their workforce, culture and business-as-usual processes will describe how those involved in providing institutional Web service should Stop Trying to Avoid Losing & Start Winning: How BS 8878 Reframes the Accessibility Question. This talk is followed by David Cornforth, Jisc infoNet who will describe his experience in Adapting to Responsive Web Design. The Changing Technical Landscape is the focus of the next strand with Martin Hamilton, Head of Internet Services at Loughborough University, explaining the move to being “open by default” in what antibiotic online might be described as The Inside-Out University. My colleague Paul Walk, in a talk entitled Working With Developers, argues that “If institutional web managers are to stay on top of their game, they need to be able get the most out of the software and systems they rely on” and to do this there is a need “to learn how to work well with the developers who build and maintain them“. Judging by the titles of the talks in the session on The View From Outside the two speakers from commercial companies are likely to stimulate lively discussion and debate. Ranjit Sidhu, founder of Statistics into Decisions, will ask 9am, 16th August, 2012: “What the fcuk just happened then?”. This is followed by Paul Boag, co-founder of Headscape who feels that Institutional Culture Is Crippling Your Web Strategy! After this busy day, delegates will have the opportunity to unwind at the wine reception which will be held at the Roman Baths. The final day begins with two Institutional Case Studies. Tim Kaner, Director of Marketing & Communications at the University of Bath, will discuss the implications of a changing marketing model for HE institutions and reflect on the challenges and opportunities ahead in a talk entitled Marketing 2.0. Dai Griffiths, Professor at the Institute for Educational Cybernetics, University of Bolton, in a talk on The University in a Bind, will argue that as Universities are finding themselves subject to increasing financial, regulatory and marketplace pressures which are pushing them in a number of different directions, institutions are constrained in their ability to adapt or reinvent their identity. Dai will explore these contradictions at multiple levels, and discuss the practical implications for the future of universities. These are times of rampant uncertainty heralded by technological, financial and social pressures. Occupying such a space can feel disorientating. We might be bewildered, afraid, excited or overwhelmed. What will it take to enable you to continue to move forward when you are no longer even sure which way you are facing? This talk will be followed by the Conclusions from IWMW 2013, which will reflect on the issues raised during the 3 days and explore ways in which the institutional Web management community can develop in the future. Uncertain times, certainly, but also times of new opportunities. I hope to see you in Bath in June. The three-day event costs only £360 which includes two nights’ accommodation. Can you afford to miss it?